Naples: Giving Beyond what is expected at work and community! Tri-Town Construction and Jarvis Property Restoration! Vicki Thomas Tracy, Chief Operating Officer at Gulf Coast International Properties Vicky has multiple degrees from Central Michigan and the University of Michigan. Having raised millions of dollars for “her town”, she is often called upon when a “get it done” person and cheerleader or a chairperson for an event is called for. Vicki ’s name is always at the top of the list when a leader is needed. When calls come for a senior in need of care cheerleader she goes into overdrive as her passion for Senior’s remain her priority. She is the daughter of Darlene Thomas, single mother of 5 children, and married to her devoted husband Steve. You can always find Vicki at the helm or in a leadership role in the community making a difference in someone’s life, be the younger residents or our older one! Vicki served on the Executive Counsel of the Above Board Chamber of Florida. Brian Rist is the Executive Chairman of The Smart Companies whose largest subsidiary is Storm Smart Inc. Started by Brian over 22 years ago, Storm Smart has grown to become the largest manufacturer of storm protection products in the United States. Due to this success, Brian has become well known as an expert in the field of storm protection, often being called upon to lend his expertise to the media, organizations, businesses, and others.On the personal side, Brian has become known as a true community leader giving both time and money to the community has called home for nearly a quarter century. Lee kraus is the consummate career sales professional. An Account Executive, sales and training manager for the Rueben H. Donnelley Company, she was recruited by the man who would become her husband to create a New Commercial Service Department in his already successful Mechanical Contracting Company. When the company was sought after and sold to the National Brand "Roto Rooter", she moved to a training position with them with the same focus. Retiring from there at age 50, she went on to become a multi- million dollar REALTOR®. Retiring again, she moved on to the become the President of the Naples Women's Club helping to grow membership from 160 to 350 members and continues in various volunteer leadership capacities in Naples, Florida. Melanie Musick, Area Director for Best Buddies Southwest Florida. a non-profit that benefits students with and without intellectual and developmental disabilities. Before Best Buddies, Melanie had served as PR Director for Lifeline Family Center in Cape Coral. Before moving to Florida, she spent over 20 years with Phi Gamma Delta Fraternity as Director of Communications and Development Coordinator for the Educational Foundation. She also writes for CapeStyle/RiverStyle Magazines. Ribbon Cutting from 5 - 8 PM! 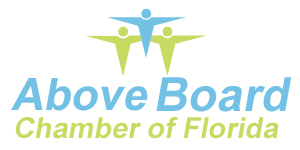 Join the Above Board Chamber on Thursday, March 7th for a ribbon cutting Grand Opening and learn all aboutCloud9 Float Spa which was founded with one mission in mind, to bring a complete wellness program to the masses at an affordable price. When we speak of wellness we are including all aspects of life including physical, mental and spiritual health. We have an amazing team dedicated to finding a treatment plan to help you reach your goals. Please register for the Naples' meeting at the top of this page! Watch for a brand new website for the Above Board Chamber designed by CONRIC PR and Marketing with even more benefits for our members!